Details: I was very saddened to hear that Colin Lloyd, who was diagnosed with cancer a couple of years ago, died earlier this week. Without Colin there would be no LTSV, for it was his regular updates on the service vehicle fleet in the LOTS newsletter that fostered my interest in the subject. Colin was the vehicle news editor for LOTS for almost 30 years, mainly covering the buses but thankfully not neglecting our 'niche' interest. When I created the first version of this website, Colin started sending in regular batches of photos taken all over London, as well as giving me access to his huge collection of photos from the 1980s and 1990s. And he introduced me to his friends Ivor, Keith, Malcolm, Phillip, Richard and Scott, several of whom have continued to provide pictures ever since. Colin also gave me reams of documents, including fleetlists which were instrumental in populating the LTSV database. Lastly, he supported the production of the SUP15B book, which then led to the re-introduction of a monthly SV column to the LOTS magazine. There are still quite a few of Colin's photos that have not yet appeared on LTSV, but there will be additions from time to time, when I feel a dip into the archives would be of interest. Here then is a view of the lorry yard at Acton Works taken on 30th November 1990. Present were at least four of the Railway Emergency Ford D box trucks which had just recently been replaced by new Mercedes-Benz demountables. 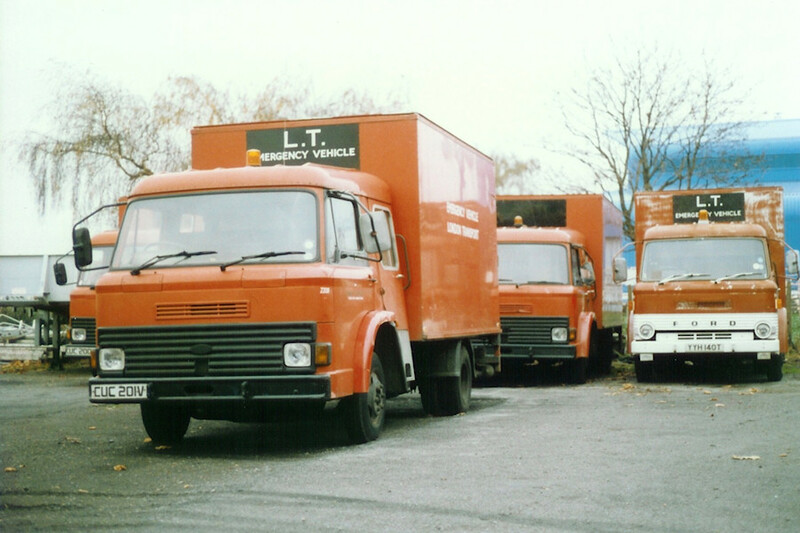 2140F on the right has the original D-series grille, with round headlamps, while the other three have the modernised design that the type featured for its final few years. 2200F, peeping in on the left, was apparently sold in October 1990. Perhaps it had just not yet been collected. The truck behind 2201F is almost certainly 2199F, as the only red D-series vans with the later grille were 2199F to 2201F and 2217F, and 2217F was sold in 1985.